1. Who is the man in the cartoon? 2. What phrase/idiom is the cartoonist illustrating? 3. What is the cartoonist’s intended meaning? b) playing the world’s smallest violin – This is a gesture made by rubbing the thumb and forefinger together, to imitate bowing a violin. It is used to express sarcasm and lack of sympathy, in response to someone exaggerating a sad story or unfair treatment. On August 21, 2013, a sarin (chemical weapon) attack killed civilians in the suburbs of Damascus, Syria. The Obama Administration has said that Syria’s President, Bashar Assad, is behind the attack. Previously President Obama had said that if Assad used chemical weapons it would be a game changer; he implied that the U.S. would take military action against Syria. After a series of events, Russian President Vladamir Putin stepped in and offered to mediate in persuading Assad to place Syria’s chemical arsenal under UN control and then destroy it under international supervision. 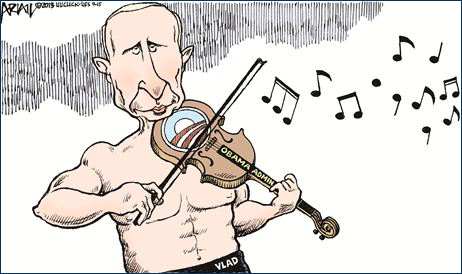 Putin comes out looking like the effective, strong world leader; Obama looks weak and ineffective.